"Pardon me good sir, but I believe you have trampled on my rights. I do not wish to be relieved of those rights at this time and it would be most gracious if you could so kindly return what is rightfully mine. Thank you dear chap." Many times in our current culture respect has gone out the window. Respect to our rights as humans and as Americans has been looked at as privileges that the government wishes to dispense. Worse than that, we are expected to go with the flow and not question authority, especially if you have nothing to hide. Even if you have nothing to hide, you also have nothing to show. This line of logic is equal to saying, "If you are doing nothing wrong, then you have NO RIGHTS!" Voltaire said, "He must be very ignorant for he answers every question he is asked." "I beg your pardon" is a typical saying that you are begging someone to overlook your mistake. Please repeat what you just said - "Pardon me, what did you say your name was?" I am sorry for what I just did - "Oh, I beg your pardon! I didn't see your foot there!" May I please have your attention? - "Pardon me, does this train go to Oakland?" I do not agree with what you just said - "Pardon me, but I think you've got it backwards." 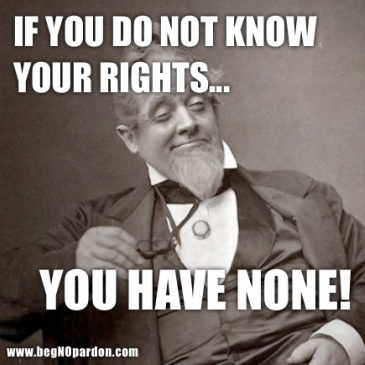 At Beg NO Pardon we believe our rights should never be begged, when a right is subverted by a government then we should ignore the law without begging for a pardon as Supreme Court rulings have vehemently declared. Remember, the government is created FOR the people... BY the people. This is fundamental in our approach to our inalienable rights. Remember in the constitution, we have certain inalienable rights... "'of these' are life, liberty, and the pursuit of happiness." There are two powerful outcomes of this. One, "of these" means there are more and are not only limited to life, liberty, and the pursuit of happiness. Second, there are many things we do every day in the name of life, liberty, and the pursuit of happiness. Who is to tell us what we are doing is not to better my life, to expand my liberty or to pursue happiness? "The constitution of the United States is the supreme law of the land. Any in conflict is null and void of law." [emphasis added] MARBURY V. MADISON, 5 U.S. 137. Did you willfully and with intent violate the law? NO: "Willfulness is one of the major elements, which is required to be proven in any criminal element. You will have to prove (1) that you are the party (2) that you had a method or opportunity to do the thing, and (3) that you did so with willful intent. Willful is defined as an evil motive or intent to avoid a known duty or task under the law." U.S. v. BISHOP, 412 U.S. 346. Since you trusted on Constitutional and Supreme Court Cases authority you did so without ill intent and motive. At Beg NO Pardon, our PURPOSE is to educate people on the rights that they HAVE lost, ARE LOSING, and what rights are affected by those lost. This serves to cause a movement of free-thinkers that care about their country. We do not hide behind a lie of giving up rights for a false sense of safety. We help teach you how to know, claim, and challenge your rights. Our MISSION it to be a voice and a light to the darkness on our country for liberties. We will do this through education, materials, scripts, webinars, workshops, etc. Our VISION is to see our nation living from the perspectives of our founding fathers in respect to the Constitution, freedom over tyranny, liberty over slavery, and truth so that every man, woman, and child can live in land of the FREE and not only a home of the brave!